Significance: Less negative than the insane guy spitting at and kicking cars on N.E. 1st avenue. Long famed for sun, sea and OAPs, Miami is gaining a name as a vibrant centre for contemporary art. Morgan Falconer explores a city reinventing itself. Coming from Britain, I always thought that the private homes of private collectors were, well, private. Charles Saatchi may throw open a portion of his collection for public perusal, but you can bet that he’ll never let you into his home. I had heard much of the generous openness of Miami’s collectors, but I never realised that I’d be able to land in Miami, make a couple of calls and find myself at the door of one of the most important collectors in the United States. I’m not greeted by a maid, but by Rosa de la Cruz herself, who leads me through a house laden with sufficient material for about five strong solo exhibitions. This is as good a primer as any for Art Basel Miami Beach, one of the world’s most glamorous art fairs. De la Cruz’s house is devoted to art — paintings, sculptures and installations arranged by artists flown in especially for the purpose. She showed me some of the most recent paintings by the newest names, such as Kelley Walker, and works purchased from shows in London and elsewhere in Europe. (You can tour her house online at tinyurl.com/yc6n3r.) We went into the dining room to see an installation by Christian Holstad which involved a woolly, tentacled gas mask construction (left). Upstairs, we looked at Assume Vivid Astro Focus, a fantastical scene blending nightclub, skating rink and video installation. But de la Cruz’s thirst is not quenched, so she will certainly be visiting the fifth Art Basel Miami Beach fair. It’s the powerful offspring of the important Art Basel, and 200 of the world’s most significant galleries will be coming to the Convention Centre for it. Like many of her neighbours, de la Cruz doesn’t just collect fine art, she collects design as well (two sets of Frank Gehry furniture made of steamed and twisted wood sit near her french windows). And to cater for that hunger the second Design Miami fair is being held this week. It’s an event that gives space to 18 of the world’s leading modern design galleries. It’s a serious business — the Pompidou Centre in Paris has brought some of its design collection to exhibit in a satellite venue. But serious or not, shoppers will also relax: I understand that one does business in the morning, lounges on the beach in the afternoon, and come nightfall one gallivants with abandon around the faded Art Deco splendour of the nearby poolside bars and restaurants that line the nearby Collins Avenue. Miami Basel has come to be seen as a catalyst and symbol for widespread changes in the area as a whole. In the 1980s the city was dilapidated, poor and famous only for druglords, pensioners and vulgarity. Although it remains one of the poorest cities in the US, parts of it are starting to show a fabulous revival. One sign of this is the Setai, the new towering beach-front development recently created by a chain of luxury hotels in Asia and the Far East. What undoubtedly lured the Basel organisers to this new location, however, is the wealth and accessibility of the private collections in the city. The Wynwood district, for instance, may be a rundown mélange of light industry, housing and cheap shops, but it is home to world-class art: one warehouse encloses the Rubell Collection, a massive trove amassed by Don Rubell (brother of the Studio 54 co-founder Steve) and his wife Mera; another houses one part of the collection of Marty Margulies, a real-estate potentate with a gargantuan appetite for sculpture and photography. Other prominent collectors sit on the boards of the city’s public museums, Miami Art Central and the Museum of Modern Art North Miami. It wasn’t until a significant generation of Cuban exiles arrived in the 1990s, bringing figures such as José Bedia, that Miami’s art scene began to come alive. The prominence of the collectors and the arrival of new galleries is persuading artists to stay. The Bakehouse Art Complex, with a mural, left, by Purvis Young. CALL it the anti-South Beach. As Miami whirls into action for the fifth annual Art Basel Miami Beach next month — the cocktail-fueled offshoot of the venerable art fair in Switzerland — the Wynwood district across Biscayne Bay is heading into the studio. 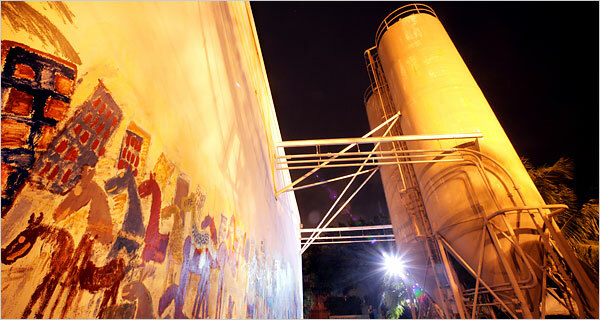 Its artistic roots date back to 1986 with the Bakehouse Art Complex (561 NW 32nd Street, 305-576-2828; www.bakehouseartcomplex.org), a nonprofit collective that offered affordable studio, exhibition and classroom space in a former 1930s bakery. By 2003, there was enough of a critical mass that the area’s galleries and artists formed the Wynwood Art District Association. Second Saturday Gallery Walks were organized, hot-pink association signs were put up and a Web site was created: www.wynwoodartdistrict.com. This year, the map has 73 sites. Unlike many art circuits, Wynwood isn’t exactly pedestrian friendly. Between the artist spaces are vast stretches of urban jungle: vacant, overgrown lots, wholesale clothing warehouses and bungalows — some fixed up, some falling down. There are few cafes or restaurants. During the day, the streets can have a deserted feel. But an artistic pilgrimage has its rewards. Among the highlights is the Rubell Family Collection (5 NW 29th Street, 305-573-6090; www.rubellfamilycollection.com), a museum that showcases artists like Keith Haring, Damien Hirst and Takashi Murakami, with almost all work bought before the artists became world famous. Another gem is the Margulies Collection at the Warehouse (591 NW 27th Street, 305-576-1051; www.margulieswarehouse.com), which has amassed one of the world’s most comprehensive collections of 20th- and 21st-century photography, with works by Walker Evans and Cindy Sherman. Wynwood is known for nurturing experimental art often deemed too cutting edge for mainstream galleries. Locust Projects (105 NW 23rd Street, 305-576-8570; www.locustprojects.org), for example, fills its warehouse space with multimedia installations. Past ones include huge stereo-speaker towers, murals made of acrylic felt and a giant flamingo made of pink bubblegum. Among the newest sites is the MOCA at Goldman Warehouse (404 NW 26th Street, 305-573-5441; www.mocanomi.org), a branch of the Museum of Contemporary Art North Miami, known for mounting ambitious exhibitions. Although the year-old warehouse space holds some of the museum’s permanent collection, it also showcases pieces by emerging artists, including light sculptures by Jennifer Allora and Guillermo Calzadilla. Bigger-name museums may be moving into the neighborhood, but the street cred remains firmly in the hands of unpolished places like the Bakehouse Art Complex. Many artists leave their studio doors open, so you can watch while they hammer away. By SCOTT GOLDSTEIN / The Dallas Morning News No towering palm trees sway over the South Dallas apartment complex that was, until recently, known as Summer Breeze. There is no stylish swimming pool, no wrought-iron fence, no pastel-colored buildings. About 60 of the 230 units are occupied at the Summer Breeze complex, which Dallas officials say is a haven for crackheads and thieves. At times, there isn’t even gas or water. It looks and feels nothing like Miami – an atmosphere developers promised was coming 18 months ago. Most of the two-story beige units that line several blocks of Hatcher and Southland streets in the shadows of S.M. Wright Freeway are boarded up, abandoned and stripped by thieves of their most valuable parts. A 2005 plan by a real estate investment firm to create a “vacation resort, right at home,” complete with Miami “pizzazz” never materialized. And a 2-year-old city lawsuit filed against a previous owner over dozens of code violations is still pending with little progress. Among the code violations cited in the city’s lawsuit: failure to keep doors and windows securely closed; failure to provide and maintain railings for balconies; holes, cracks and other defects in stairs, porches, steps and balconies; and standing water and flooding on the premises. The real estate investment firm that promised a “Miami-fied” complex is Hilton Head Properties Inc., based in Dallas, according to its Web site. The firm also promised central air and heat systems and new cabinetry, water heaters and ceiling fans. As with past owners, residents said, it appeared for a brief time that renovations were being made. They soon ceased, however, and the “Miami-fied” look never materialized. A Hilton Head subsidiary that operated the complex declared bankruptcy in fall 2005, and the parent firm sold the property this month. Michael Davis, Hilton Head’s chief financial officer, said he recently started at the company and was not aware of the specific plans for the site. He blamed constant thefts and the resulting increase in insurance rates for the project’s failure. The subsidiary company filed bankruptcy, he said, to properly manage debts inherited from a previous owner. “Basically, we’re a real estate investment company, and we had an offer on the company, and to protect our investors we sold it,” Mr. Davis said. The property’s new owners, Southland Terrace Apts. LP, aren’t saying much about their plans for the buildings, most of which were built in 1926, according to the Dallas Central Appraisal District Web site. Ron Almeida, a partner with Southland, said in a written statement that his company is beginning the long process of cleaning up and familiarizing itself with residents. Clara Davis, hired by Hilton Head as property manager about a year ago and retained by Southland, said it’s no easy feat keeping up with all the problems at the property, where about 60 of 230 units are occupied and rent generally runs between $300 and $650. Increased police presence and a neighborhood watch group might help, she said. After working with a company that promised much and did little, Ms. Davis said she is optimistic the new owners are genuinely interested in improving the property. The many vacant units on the property are an invitation to drug users and the homeless, particularly in the colder months, police said. Longtime residents – some of whom have lived there nearly 40 years – recall a time when the complex was a thriving, tight-knit community. It has the potential to be such a place again, they say. After 31 years at the complex, Ms. Crane, 76, has learned to adapt to whatever the next day brings. As she prepared to deal with a day without water or gas, a cockroach scrambled across her kitchen stove. The city attorney’s office was investigating Ms. Crane’s reported problems as of Wednesday. It appeared the water and gas issue was confined to only a few units in her building, and officials were working with the property management to address it, said Greg McGhee, assistant city attorney. Mr. McGhee said that the city hasn’t taken additional action against the complex because the problem with the utilities appears confined to only one building there. Ms. Crane has to fill her green bucket with water from a neighbor’s hose or use gallon jugs delivered by her granddaughter from Pleasant Grove for her drinking and bathing water. Lev Leviev and Shaya Boymelgreen are the biggest land owners in Parkwest, but Daniel Kodsi is stepping up to the plate. Leviev and Boymelgreen’s parcels are smaller than Kodsi’s large parcels. LB’s land acquisitions, for the most part, took place either in 1999 or shortly thereafter. The parcels were acquired from local parking lot magnate Hank Sopher. Until 2005, Leviev and Boymelgreen had been the undisputed landlords of Parkwest. In 2005, Daniel Kodsi acquired several significant parcels in the neighborhood. This pattern is important to see because it indicates that these two separate entities are likely to be the most active in changing the area and capitalizing off of its progress. It also indicates that these developers consider the area to be a high priority on their land portfolio. The entire west side of N.E. 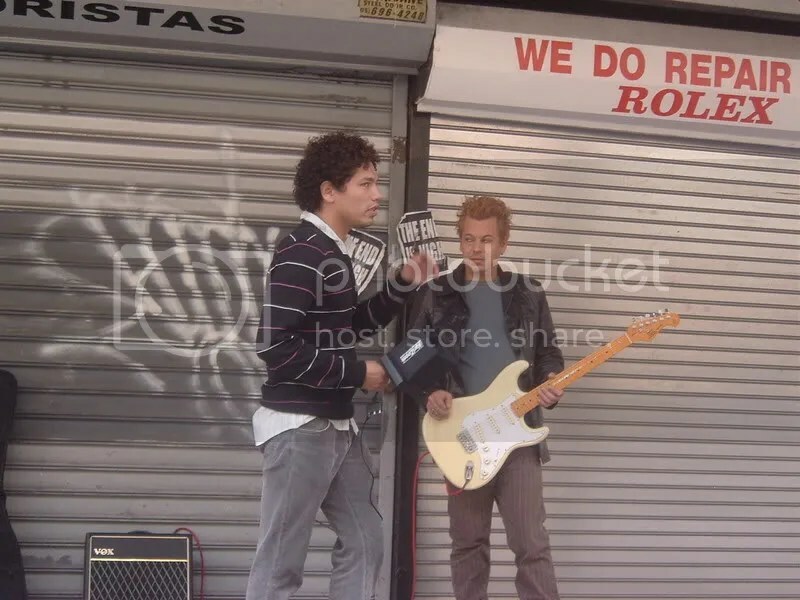 2nd Avenue from 11th street till 7th street is owned by either Leviev/Boymelgreen or Daniel Kodsi. For all intensive purposes they are the landlords of what is fast becoming one of Miami’s most important urban neighborhoods. In studying land acquisitions, one will find that Parkwest is where Leviev/Boymelgreen has the biggest cluster of parcels. Considering their extensive financial resources, development experience, and ambitious current plans, one can almost count on them transforming Parkwest to the point of being unrecognizable. 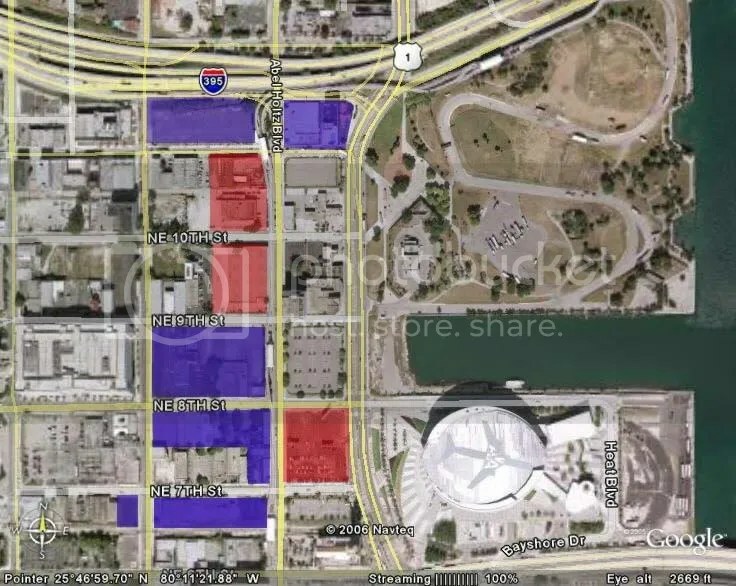 Kodsi’s presence in the neighborhood implies that his Paramount Park project was more of a bridgehead in the area, while these later acquisitions are a sort of invasion into the heart of Parkwest. He will have room for at least two more major developments on parcels located on the west side of N.E. 2nd avenue on 9th and 10th streets—behind 10 Museum Park and 900 Biscayne respectively. Leviev’s plans for Marquis West on their N.E. 2nd avenue and 11th street lot indicate that their future projects will be similarly dense. Although high density is a safe guess, it’s not clear what Daniel Kodsi will do with his parcels to the south of the Marquis West. Considering all of his Paramount projects, he is likely to think and act big. Under the surface, Parkwest is rumbling with activity. Look for these development juggernauts to steamroll forward with big plans for Parkwest soon.